Steve Rogers has been through hell. Marvel’s Secret Empire event took the character to a dangerous place, one that spent the best part of a year muddying the public image of both one of comics’ most beloved heroes and his publisher. This week, the Steve we knew is back, but his new comic isn’t quite yet willing to address his recent history. Instead, it wants to concentrate on all his other years as a hero. 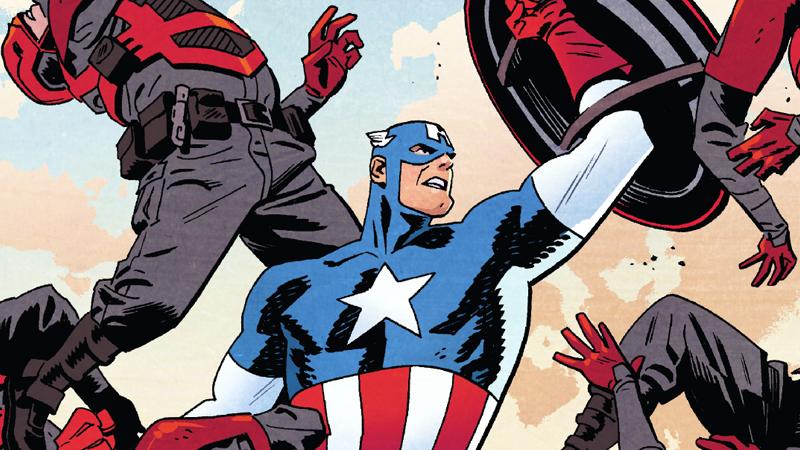 Captain America #695 is the first issue of a new run spearheaded by Mark Waid, Chris Samnee, and Matthew Wilson. (#695 is an approximate number brought about by Marvel’s still-bizarre decision to mush disparate comic runs into one cohesive aggregate for its new Legacy initiative.) This installment kicks off a storyline that has promised to tackle how the Marvel Universe feels about Steve Rogers in the wake of his stint as a Hydra-championing fascist ruler in Secret Empire, by sending Steve on a “Superman in Grounded”-style roadtrip of reflection across the U.S. But don’t go into it expecting it to be tackling the events of Steve’s recent past head on just yet: For now, it’s more about remembering the nostalgic familiarity of Captain America’s golden days. From its setting and story to the retro-feeling of Samnee’s classical, heavily-inked art and Wilson’s warm, yet slightly faded colors, the whole issue feels like a throwback to the classic comics of yesteryear. This is not necessarily a bad thing. In fact, Captain America #695 serves as an affectionate and forceful reminder of the things Steve Rogers has spent decades standing for before Secret Empire dragged him through the mud. Starting in media res with an adventure set just after Steve emerged from the icy sleep he was left in during World War II, the first stage of Steve’s Captain America Redemption Road Trip 2017 takes him to Burlington, Nebraska. The small Midwestern town is the site of Steve’s first post-ice superhero appearance, an event that lead the town to become a mecca for all things Cap, right down to literally renaming itself after the hero. As much as readers may want Marvel to acknowledge the events of Secret Empire here, setting the story in the middle of a festival dedicated to Steve’s appearance in the town a decade ago creates the perfect environment to brush all that unpleasantness aside for nostalgia’s sake. The people of Captain America (née Burlington), Nebraska, are far too much in love with the image of what Steve was when he first came to the town to acknowledge what he’s been for the past year. To some, this may feel like a cowardly way out of addressing the wide discontent Secret Empire brought with it. But Captain America #695 instead finds strength in amplifying the voices of the sort of people horrified and shocked by what Secret Empire did to Steve, but without blaming him. These ordinary people also talk about how they’ve defended Steve’s own ideals. Everywhere Steve goes at the festival, he sees people sharing stories of courage and optimism, stories of how Captain America is a role model, how Captain America represents hope and justice, how Captain America definitely punches Nazis. And when the same faction of supremacists Steve fought in the town a decade ago shows up to cause havoc again, Steve leaps into action and does what he has spent the majority of his life doing: defending the innocent from evil, standing up to bullies, and being the shield that protects those that need it most. But he also raises up the people he’s just defended—when the crowd turns to adulate Steve once more, he points out the acts of heroism of the ordinary people all around them, coming together to protect the wounded or keep people out of harms way. That they’ve praised Captain America enough, and should start praising the people inspired by his heroism to become heroes of their own making, instead of just fans of one. Secret Empire devolved into the hackneyed end its publisher desperately wanted to convince discontented fans it would not devolve into. Before that happened, I said it would take a lot to bring Captain America back from the brink Secret Empire took him to and that turning him back into the hero fans loved so dearly would be a daunting prospect for anyone involved. Remembering the inspiring idealism of the character’s less-recent past is not the worst way to go about it, although Marvel’s still going to address it sooner or later. But, for now, the warmth of nostalgia helps to serve as a bright and bold mission statement for what Steve Rogers is today as he enters Marvel Legacy—and really, what he always should’ve been.